Welcome to the Essentially England Newsletter which, unsurprisingly perhaps, has a bit of an American focus today. A friend reminded me yesterday that everyone in the US will be celebrating Independence Day come Tuesday. Which in turn reminded me of… Sulgrave Manor in the beautiful Northamptonshire countryside. It’s a gorgeous, incredibly well-groomed Tudor manor house that’s also a small slice of America, slap bang in the middle of England. Driving up, we passed a company of Morris Men complete with Hobby ‘Oss dancing to the tune of Oh Susanna outside the Star Inn, which seemed a little strange… until we found out that they were visiting Morris Men from across the pond. At that point, it made sense. As did the Stars & Stripes flying alongside the British flag outside the manor. 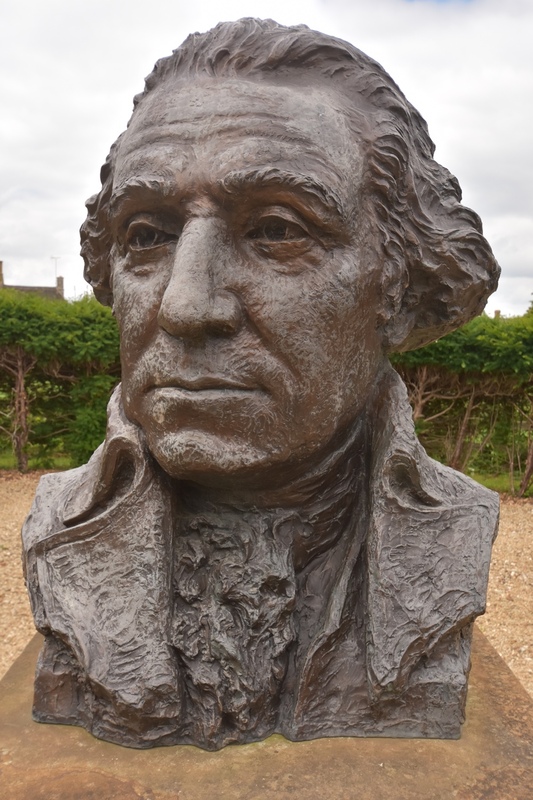 That’s because Sulgrave Manor is the ancestral home of George Washington, and the manor and the land it sits on were presented to the people of both countries to commemorate years of peace and cooperation between the USA and Great Britain. The house dates to 1539, when Lawrence Washington bought the land during the dissolution of the monasteries. He paid the princely sum of £321 14s 10d… and set about building himself a house. He was 39 at the time, well past his prime by Tudor reckoning, but he didn’t just see his house finished, he also went on to have eleven children with his second wife. A late starter, perhaps. The house used to be much larger, but what remains is stunningly preserved. The Washingtons were very well off, and you get a sense of their quest for wealth and status as you explore the hall, the parlour, upstairs bedrooms and kitchens. The family lived at Sulgrave very comfortably for over a hundred years and only came to grief during England’s bloody Civil War. The Washingtons, and I find this somewhat ironic, were staunch Royalists. After the death of Charles I, John Washington, great-grandson of Lawrence, emigrated to Virginia… quite a common choice for men who felt that Cromwell’s Puritan England held only persecution and little in the way of prospects. After a bit of a rocky start, John Washington did well for himself. He settled in Virginia, had a family, and George Washington, the first president of the United States, was his great grandson. George Washington never actually got to see Sulgrave Manor. He didn’t ever visit Britain, as far as I know. But the home his family came from still survives and - whether you are a fan of American history or not - it makes a great day out. Explore the house, wander the gardens, and follow George Washington’s exploits in the exhibition. You could also watch a cookery demonstration - either outdoors or in the fully functional Georgian kitchen - or learn how to make Tudor specialities yourself at one of the workshops. 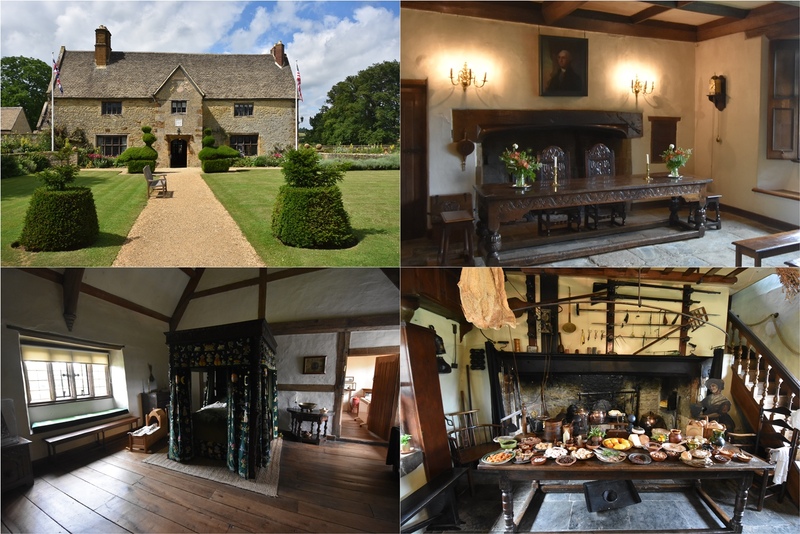 Sulgrave welcomes school parties all year round, there are exciting, open events at different times of the year… and you could even get married in the hall at Sulgrave Manor and hold your reception in the beautiful grounds. So whether you’re based in the UK and visit Northants, or whether you’re coming from abroad to find out more about George Washington… don’t miss this little gem of a historical property. 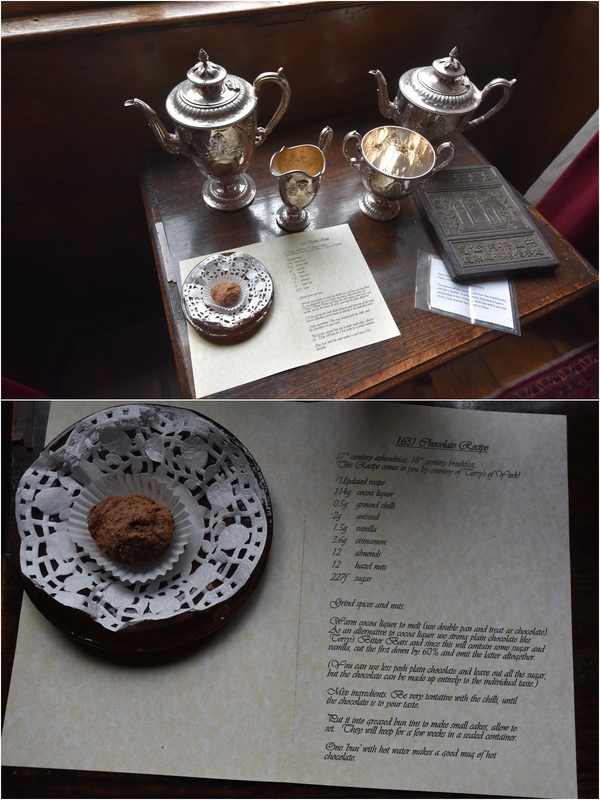 Sulgrave Manor has a lovely little tea room…and yes, we stopped for a cuppa, scones, jam and cream, and a slice of rich chocolate & Guinness cake that was moist and delicious and had a soft, cream cheese frosting that wasn’t gooey and sweet. I did enquire and I know where to find the recipe… so I might be sharing this in the near future. For today, I have something I found while visiting the manor house. A recipe for hot chocolate dating back to 1631! Back then, when men gathered in coffee houses to discuss politics, and when tea was a new treat for the ladies to enjoy at home, chocolate was rare and expensive, served in silverware, and… thought of as an aphrodisiac. As such, it was enjoyed mostly by the men of the family and when they shared the treat, it was to show off their wealth or impress their guests. What intrigued me was the recipe itself, which had a couple of cute surprises up its sleeve. For one, rather than a mug of hot sweet drink, this recipe makes small chocolate “buns”. To make the drink we all know and love, you simply place a bun into a mug and then add hot water. Instant hot chocolate a la 1631! The second surprise were the ingredients. For me, the best hot chocolate isn’t overly sweet and is laced with heaps of my favourite spice… cinnamon. If anyone had asked me, I would have said that chili chocolate is a recent fad, but…no. John Washington would have known to add chili to his hot chocolate as well as anise and it wouldn’t have been very sweet at all. So, why not give this Tudor recipe a try one day and see how it compares to your favourite hot chocolate. How about a triangular building that's full of religious allusions? Or the story of an earl who planted a garden to seduce a queen? As usual, I cannot make up my mind, but I'm hoping that by the time August has rolled around, I've tossed a penny or two!